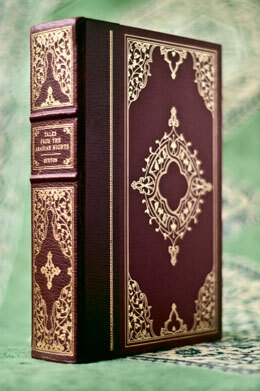 Condition: Hardcover, burgundy leather spine with cloth boards. Very good. Slight scratches to gilt and slight bumping to edges of cover. 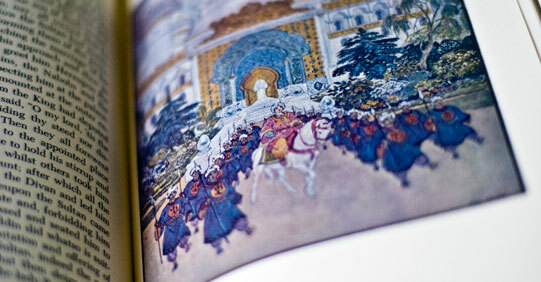 One Thousand and One Nights (Arabic: كتاب ألف ليلة وليلة‎ Kitāb ‘alf layla wa-layla; Persian: هزار و یک شب Hezār-o yek šab) is a collection of Middle Eastern and South Asian stories and folk tales compiled in Arabic during the Islamic Golden Age. It is often known in English as the Arabian Nights, from the first English language edition (1706), which rendered the title as The Arabian Nights’ Entertainment. The work as we have it was collected over many centuries by various authors, translators and scholars across the Middle East and North Africa. The tales themselves trace their roots back to ancient and medieval Arabic, Persian, Indian, Egyptian and Mesopotamian folklore and literature. In particular, many tales were originally folk stories from the Caliphate era, while others, especially the frame story, are most probably drawn from the Pahlavi Persian work Hezār Afsān (Persian: هزار افسان, lit. A Thousand Tales) which in turn relied partly on Indian elements. 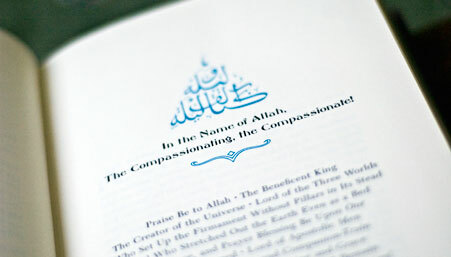 Though the oldest Arabic manuscript dates from the 14th century, scholarship generally dates the collection’s genesis to around the 9th century. 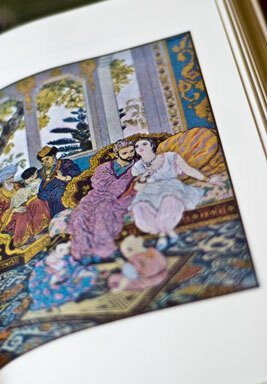 What is common throughout all the editions of the Nights is the initial frame story of the ruler Shahryar (from Persian: شهريار, meaning “king” or “sovereign”) and his wife Scheherazade (from Persian: شهرزاده, possibly meaning “of noble lineage”) and the framing device incorporated throughout the tales themselves. The stories proceed from this original tale; some are framed within other tales, while others begin and end of their own accord. 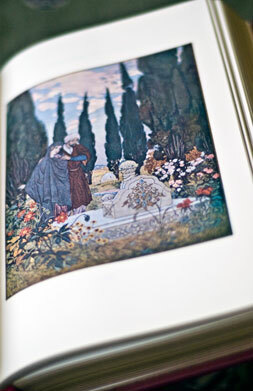 Some editions contain only a few hundred nights, while others include 1,001 or more. 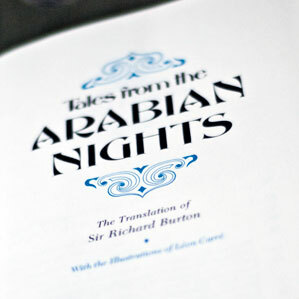 Some of the best-known stories of The Nights, particularly “Aladdin’s Wonderful Lamp”, “Ali Baba and the Forty Thieves” and “The Seven Voyages of Sinbad the Sailor”, while almost certainly genuine Middle-Eastern folk tales, were not part of The Nights in Arabic versions, but were interpolated into the collection by Antoine Galland and other European translators. (Wikipedia entry).